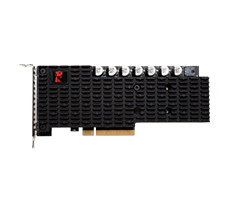 Random I/O and high data access demands can be severely impacted by traditional mechanical hard drives in a virtualized host. Retrieving data and servicing enterprise applications and users have become limiting factors in overall system performance. Kingston solid-state drives (SSDs) are the ideal storage accelerator solution for virtualized workloads and contribute to a fundamental goal of virtualization by doing more with less. As cloud-based storage becomes increasingly popular, new demands are being placed on the storage infrastructure. A tiered storage model ensures that an organization has the right data on the right tier to maximize not only cost but also performance. The fast-retrieving capabilities of SSDs enable cloud services to operate at peak efficiency for each type of data being processed. 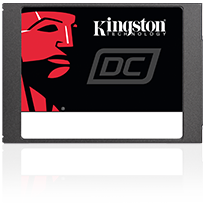 Kingston’s SATA 3.0 Enterprise SSDs provide users with very fast data access for a wide variety of enterprise applications. They can be used as direct attached storage replacements for hard disk drives in a server or reside in external arrays to speed up storage-bound applications. What sets enterprise solid-state drives apart from client SSDs? Testing is a cornerstone of our commitment to deliver the most reliable products on the market. We perform rigorous tests on all of our products during each stage of production. These tests ensure quality control throughout the entire manufacturing process. To avoid a scenario where the SSD is filled to full capacity with invalid pages, over-provisioning is used by the SSD controller’s garbage collection function as a temporary workspace to manage scheduled valid page merges and reclaim blocks filled with invalid (or deleted) pages. After an SSD is assembled, the SSD manufacturer can reserve an additional percentage of the total drive capacity for Over-Provisioning (OP) during firmware programming. Over-provisioning can improve SSD endurance, performance and more. Drive Writes Per Day (DWPD) calculations use the TBW specification of a drive to calculate the number of times the user capacity of a drive can be written per day over the warranty period (or a different number of years). Caltech professor Harvey Newman describes how data generated from the CERN (The Large Hadron Collider) is analyzed and shared between different research facilities around the world and how the DCP1000 plays a key role in the distribution and processing of this data for scientific discoveries. What is NVMe? NVMe (Non-Volatile Memory Express) is a communications interface and driver that defines a command and feature set for PCIe-based SSDs – Efficiently increase performance. Learn how Overprovisioning can reduce access latency time, maintain high performance levels and help meet endurance and service life expectancy. End-to-End Data Protection protects customer’s data as soon as it is transferred by the host system to the SSD, and then from the SSD to the host computer. All Kingston SSDs incorporate this protection. Learn how companies like yours put SSDs to work in enterprise environments. A variety of customer case studies based upon product experience and highlights. Check here to see which Kingston parts are qualified for your system or software. * Benchmark scores, results and test methodology stated in published reviews and articles are at the sole discretion of the reviewer and website or publication. Individual results may vary due to the revision of hardware, host hardware, software and usage.